The new Weber Genesis II SE-410 Gas Grill is available at Foreman’s General Store in Colleyville, TX. 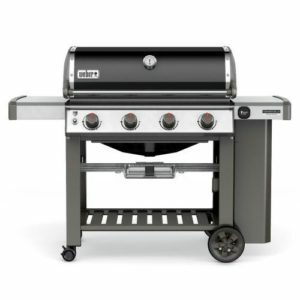 The porcelain-enameled Weber Genesis II SE-410 Gas Grill features four (4) stainless steel high-performance burners that produce 48,000 BTUs of power. The Genesis II SE series gas grills come fully equipped with 7mm stainless steel cooking grates, stainless steel Flavorizer bars and stainless steel heat deflectors to effectively hold and distribute heat evenly over the 646 square-inches of cooking grates. The Tuck-Away warming rack provides an additional 198 square-inches for a generous 844 square-inches of total cooking area. The Genesis II grills come equipped with a Grease Management System that makes clean-up as easy as possible. The porcelain-enameled hood has a center-mounted thermometer to monitor cooking temperatures and has painted cast-aluminum end caps. The Genesis II SE series grills are iGrill 3 ready and features a fuel gauge on propane gas models. The welded tube frame, open cart design includes two (2) shelves below the control panel and two (2) side shelves, providing much needed prep and two (2) heavy-duty locking casters and two (2) large wheels. On the propane gas models, the propane tank is stored to the side, freeing up the shelf space under the grill and has a tank shield that keeps the tank out of view and the natural gas models include a 10-foot flexible hose. Six (6) convenient built-in tool hooks keep your BBQ tools nearby.